Yeast has been used for centuries in fermented beverages and foods, but over the past 20 years this organism was established as a robust platform for the production of a wide range of chemicals, such as biofuels, bulk chemicals, pharmaceuticals and nutraceutical ingredients. Artemisinin (a terpenoid used in the treatment of multi-drug resistant malaria) and resveratrol (a natural phenol with antioxidant properties) are some of the most famous examples of natural products produced by metabolic engineered yeasts (Becker et al., 2003 and Ro et al., 2006). More recently, yeast was genetically modified for the synthesis of morphine and semisynthetic opioid pharmaceuticals (Hawkins & Smolke., 2008 and Thodey et al., 2014). Opiates are a group of natural drug molecules (benzylisoquinoline alkaloids) produced by Papaver somniferum (opium poppy) mostly used for treating pain (Bernáth, 1998). The principal painkillers derived from opium are morphine, codeine (also used has a cough remedy) and thebaine, which is further refined by chemical processes to create high value pharmaceuticals such as oxycodone and hydrocodone, also known for the commercial names OxyContin and Vicodin. The group of Christina Smollke in Stanford University genetically modified the baker’s yeast Saccharomyces cerevisiae for the production of opioids by the introduction of heterologous genes from P. somniferum and the bacterium Pseudomonas putida. In 2014 Smollke’s team published a new study in which yeast was bioengineered to convert the opiate precursor thebaine to codeine, morphine, hydromorphone, hydrocodone and oxycodone. 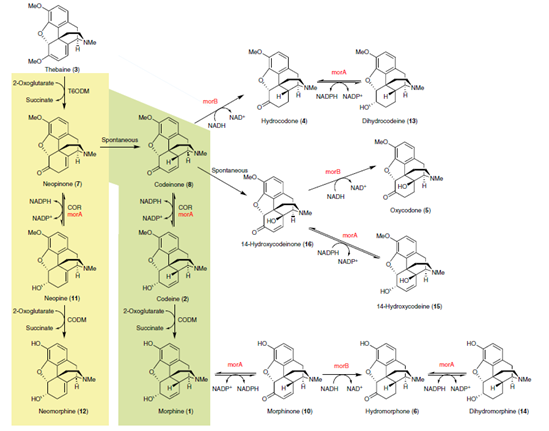 In opium plants, morphine is biosynthesized from thebaine via 2 biosynthetic routes by the activity of the dioxygenase thebaine 6-O-demethylase (T6ODM) or O-demethylase (CODM) that demethylates thebaine at a distinct position. One route (i) generates the intermediates neopinone, codeinone and morphine and a minor route (ii) generates oripavine and morphinone as intermediates to morphine. This study, also identified a new route to neomorphine (iii), that only occurs in the context of bioengineered yeast cell, revealing new types of substrates for codeinone reductase (COR) and CODM never reported before (see Figure 1). Despite this new discovery, this new opiate pathway (iii) in the engineered yeast cell is undesired, because it redirects part of the precursor thebaine to the synthesis of neomorphine instead to the morphine synthesis route. Figure 1. 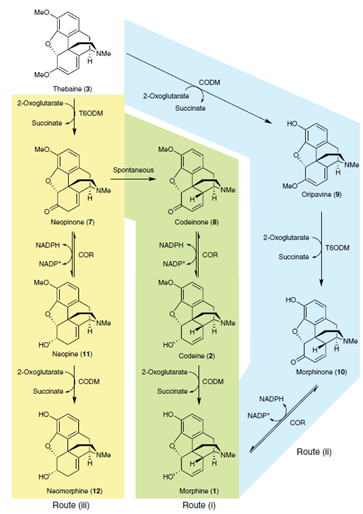 The biosynthetic routes for the synthesis of morphine in opium plants (i) and (ii). Route iii shows the newly identified biosynthetic route in yeast to neopine and neomorphine from a diverted pathway flux (Thodey et al., 2014). The researchers used different strategies such as gene copy number optimization, co-substrate supply enhancement and spatial engineering, in order to enhance the opiates biosynthesis by yeast. The final engineered strains were reported to produce 7.7 mg/L codeine, 4.7 mg/L of morphine, 1 mg/L hydromorphone, 51 mg/L of hydrocodone and 70 mg/L oxycodone. The morphine producing yields were lower than expected by the researchers. The reason that explains the lower production of morphine is the production of neomorphine by the activities of COR and CODM on neopinone and neopine (see Figure 1). The biological synthesis of semisynthetic opioids was achieved by the incorporation of different bacterial enzymes in yeast. Thebaine was converted into different opioids by the introduction of a heterologous pathway containing the morphine dehydrogenase, morA and morphine reductase, morB from Pseudomonas putida M10 (see Figure 2). Figure. 2 Biological synthesis of semisynthetic opioids from thebaine by the incorporation of enzymes from the bacterium Pseudomonas putida M10. The goal of Smollke´s team is to create a pharmaceutical biofactory in which all the steps, from poppy plant through the subsequent 17 chemical refining steps, are performed by yeast. The group is now working in designing a single strain that can express all the enzymes necessary to convert simple sugars to morphine and the semisynthetic opioids oxycodone and hydrocodone. Becker, J.V. et al. Metabolic engineering of Saccharomyces cerevisiae for the synthesis of the wine-related antioxidant resveratrol. FEMS Yeast Res. 4, 79-85 (2003). Bernáth, J. Poppy: the genus Papaver. (Harwood Academic Publishers, Amsterdam, the Netherlands, 1998). Hawkins K.M. & Smolke C. D.. Production of benzylisoquinoline alkaloids in Saccharomyces cerevisiae. Nature Chem Bio. 5, 564-573 (2014). Thodey K., et al. A microbial biomanufacturing platform for natural and semisynthetic opioids. Nature Chem Bio. 10, 837-844 (2014). Ro, D.K. et al. Production of the antimalarial drug precursor artemisinic acid in engineered yeast. Nature 440, 940-943 (2006).